There are a lot of fisherman out there that love to target trout. They love chasing them down in the local lakes and ponds during the “stocked” trout season or chasing the big girls out on Lake Michgan. If you want to talk about a trout species that gets a bad rap then all you have to do is mention the Lake trout. Laker, Greaser, or Grease ball are a few of the names that they have taken on over the years. The forage they feed on in the Southern part of Lake Michigan allows their flesh to take on a less than desirable oily taste. This does not stop some of us die-hard fisherman from getting out in the cold November air and chasing after these hard fighters on light tackle. Most often these fish are not considered by many to be a targeted species to catch. They are often caught on accident while in search of King or Coho Salmon. However, in the late fall and early winter you will find these fish coming up onto the manmade reefs as well as near shore to spawn. This is a great opportunity to get in on some hard fighting action. These fish are going to be accessible not only by boat, but the shore anglers can also get the opportunity to tangle with a fish or two. The techniques to target the Lakers are simple, yet effective. Trolling is a popular and often utilized technique. Fishermen use a simple rig of a Spin-n-glo and a 0 dodger. This is the same style as a dodger/fly combo. Some of the popular colors for the dodgers are trashcan (smoke) or clown. The spin-n-glow is just a simple cork with wings on it that make the cork spin. This is rigged on a leader about 14”-18” long with a 1/0single hook or treble hook and a few colored beads separating the hook and spin-n-glo. The brighter colors of the Spin-n-Glows seem to produce the best. Whites, yellows, and oranges can be found in most angler’s boxes. Other presentations that the troller prefers are long slender spoons with bright accent colors as well as larger body baits that will imitate the existing forage. The key to these baits is to use a slower troll than what you are used to. During the summer months your speeds may be in the 2.8mph, but in the colder water that speed needs to drop down to around 2.0mph. Wire or Braided line with a deeper diver set-up works well for this type of trolling because they allow you to get the baits down to the fish and allow for quick depth adjustment when going over a snag filled reef. Downriggers are also used, but caution should be used as it is easy to hang up on the structure if you get too close to the bottom. This can cause you a major headache when you try to free the downrigger weight. 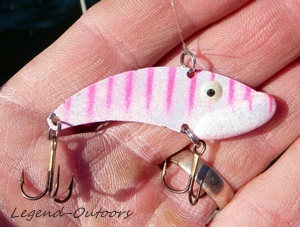 Other options to target these fish when they are closer to the harbors and on the reef structures is to jig for them. Baits such as a 3/8oz darter jig head and gulp jerk shads in white or shiner colors, blade baits, or slab style jigging spoons work quite well. You will get hung up a lot on the rocks so have plenty of spare baits with you. The equipment set-up for this is pretty basic. A 7’ to 9’ spinning rod spooled with braided line and a good fluorocarbon leader is something that most fisherman have in their arsenal. The braided line will allow you to have a better feel of the bait and offers little to no stretch for a better hook set in the deeper water. The braid and fluorocarbon will also offer better abrasion resistance from the rocks below. The shore guys also have chances to catch these spawning fish. This can be done with some of the same tactics as you would use from a boat. Find areas that have some deep water close to shore as well as some rocky structure. There are areas from Milwaukee on down to Michigan City that will hold Lakers in the fall. The equipment choice will be very similar, however longer rods are recommended to allow the most distance out of a cast. The more water you cover the better your chances of finding fish are. Braided line is still a key player in your equipment as well as good quality snaps and hooks on your baits. Your presentation will be casting spoons as well as deep diving body baits. Jigging gulp or large Kalins style twister tail grubs will also produce fish. The key is to make sure you get your baits as close to the bottom as you can and keep your retrieve slow. Vary things up a bit with a pause and twitch retrieve and this will often trigger a strike. Trout aren’t just a brightly colored fish that are sought after with long fly rods and tiny flies. 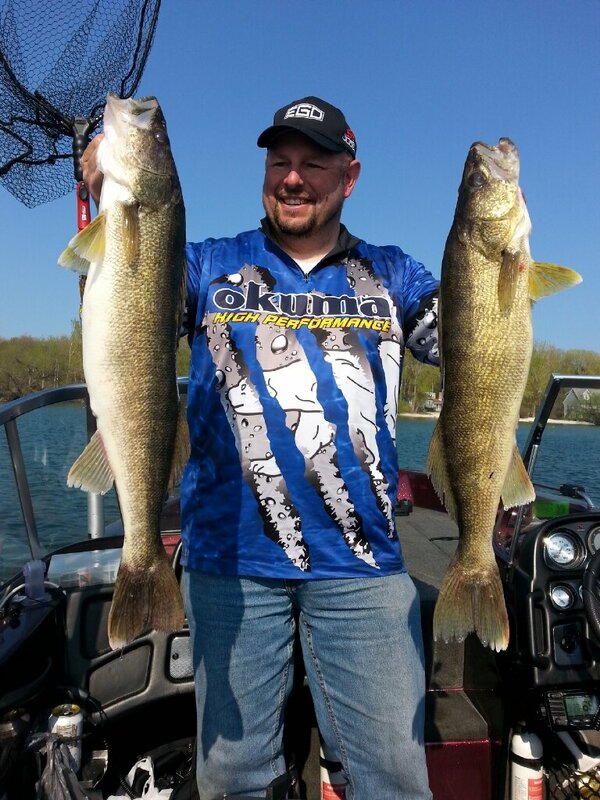 The Great Lakes offer up some excellent opportunities for big fish and with a little time and effort anyone of any skill set can target these fish. Just because the leaves are starting to fall off of the trees and the deer are moving in the woods it doesn’t mean that it’s time to give up fishing the lakefront. The fall can be very productive and offer some great opportunities to catch some big and colorful fish. Take advantage of this time and find out just what you may have been missing in the past.